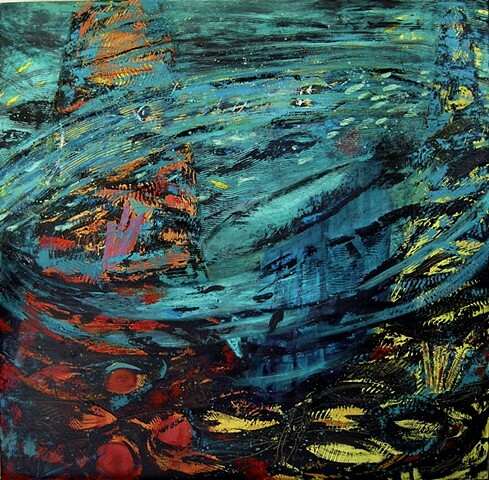 Cowichan Valley Art Council Fine Art Exhibition Duncan BC Opens May 1. 160 pcs from 160 local Artist. Come and see the wealth of artistic expression in our beautiful Valley. the show runs for two weeks. Welcome to visitors who wish to see my artwork. I will be opening my studio to the public by appointment starting June 1, 2019. 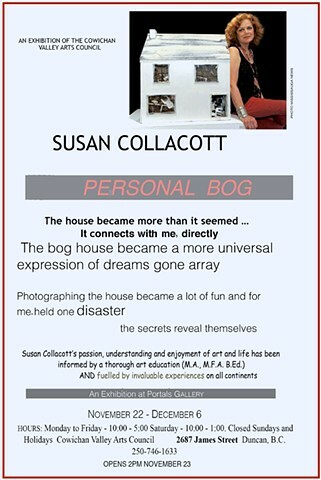 Be sure to check out my web site susancollacott.com thoroughly before coming as I can pull out work that you may be interested in. New work will be available as well as some real beauties from past series as good as new. The Studio is in Cobble Hill, BC, a half hour north of Victoria BC. You will find portfolios of paintings in series and photo digital work. Earlier work can be seen on the ccca.ca web archive . I would welcome any queries as to the purchase, exhibition or placement of my artwork through designers. Statement: My art evolves from the mysteries of nature, earthly phenomena of creation, process and memory. Each painting is an interpretation of my experiences with the natural world from travels to dinosaur resting places, coral reefs and volcanic sites around the world. and related work in the newly refurbished gallery in the Art Centre in Duncan BC. I am fortunate to find many supportive people here which helps when moving into a new community. THIS was the top attended Exhibition for the CVAC to date. Many people old and young found it very moving and meaningful. Jim Turner son of the art lover Fred Turner who collected many of my early paintings from the mid-70s, asked me to show at his house opening and has become a collector of my work also. 2000 Toronto Star, Peter Goddard, Dec. 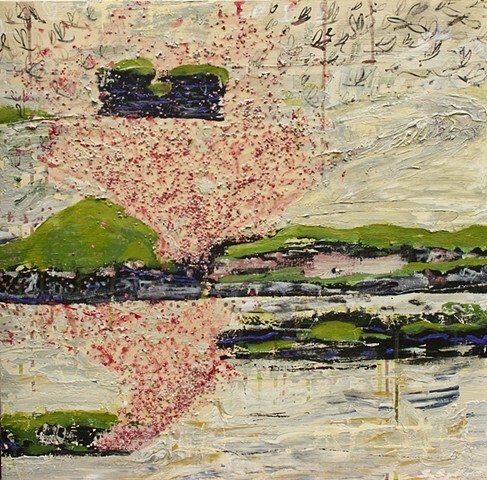 In contemporary art, landscape often serves as a neutral means to a highly theoretical or conceptual end. So it's unusual when an artist's approach to the landscape is unapologetically rooted in reverence for the natural world itself. Susan Collacott' s digital prints radiate a primordial earthiness and an immense sense of geological time. Inserted or superimposed images of fossils lend the landscape photos an even more organic sense of untamed nature. Collacott burnishes her surfaces and textures, suggesting the shimmer of water or the roughness of volcanic rock, to give the prints a rawness much like lithographs or woodblock prints. 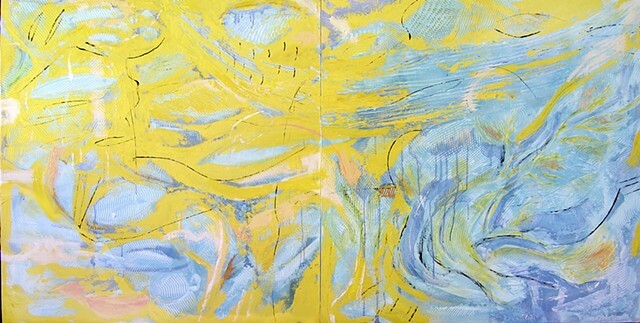 The two paintings here might be termed gestural or abstract but are really anything but. Their rhythms and colours are closer to visual echoes of natural patterns: autumn leaves reflected in the surface of a lake, or kelp strands twining around reefs of coral. They are distillations of visual experience from the natural world into swirls of pattern and colour. Collacott's use of fossils recalls the thousands of once-flourishing species that have come and gone over the last 6 billion years. Her vision of nature centres around an earth that may shrug off any trace of our own passing. Nature has been around for much longer than we have, Collacott's work seems to say, and it will outlive us. 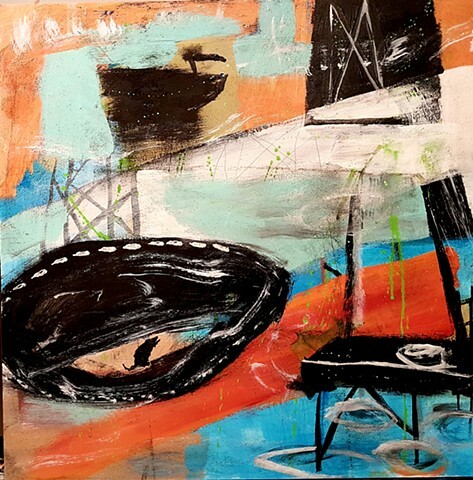 Susan Collacott at the Engine Gallery (1112 Queen West) to April 29. French artist Pierre Maraval calls his photo exhibitions ‘‘human landscapes,'' each a collection of 1,000 portraits of individuals linked by a common characteristic or shared passion. Athletes, AIDS workers, Internet pioneers, and women from some of the world's greatest cities are among those whom Maraval has celebrated since he began his project in '93. Now he turns his lens on Toronto and the women who enrich the city's flourishing cultural scene through Toronto's Mille Femmes. Toronto's Mille Femmes is a tribute to 1,000 artistic, creative and inspiring women from Toronto and their protégés, who embody the passion and heritage of the city. Architects, actors, dancers, designers, journalists, musicians and others have been chosen in recognition of their achievements and leadership in their field. Joined together, the 1,000 portraits will become a visual network, a chain of recognition that celebrates not only an extraordinary community of women, but also the creative character and diversity of Toronto.